Back in the day when this website was still young, you might remember that we threatened promised to report interesting stories from the front lines of urban river restoration everywhere. … and presumably much of the rest of Farnham from catastrophic flooding if such an ill-conceived flood-plain development were ever allowed to take place on this natural flood storage reservoir (yes, the sort of flood storage that almost everyone else is desperately trying to put back elsewhere). “… Species rich pastures are the UK’s most threatened habitats and anything we can do to reverse this trend of disastrous decline must be grasped. 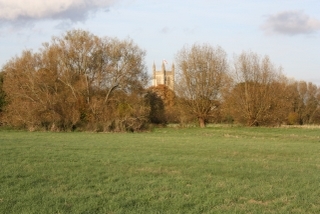 Restoring Bishops Meadow to its former glory should be the first step in reclaiming the entire river meadow system that runs from the historic centre of Farnham to Waverley Abbey via the now derelict Moor Park meadows. Farnham is blessed with such unique landscape features: Farnham Park to the north, the old Farnham Heath to the south and running through it all, like a necklace of green jewels, the neglected wonder of the water meadows. What this town needs urgently is a Farnham river meadows conservation policy”. The first Bishops Meadow Trust AGM will take place on 24 March: if you live in the area, this looks like a great local cause to get involved in. This entry was posted in Uncategorized and tagged River restoration, Views from the Wandle on March 9, 2010 by Theo.